For Use with CU200 Only! Whether it's used for livestock watering, a pressure system on a remote cabin, or for irrigation, the SQFlex system can be tailored to meet any requirements. Based on the location, depth to water, and the volume of water required, Grundfos' exclusive sizing program finds the best pump and most efficient energy source for your application. The SQFlex system from Grundfos is not just another solar pump; it's a revolution in remote water supply. Designed for maximum reliability, maintenance-free operation, and the flexibility to adapt to virtually any application, SQFlex provides water wherever necessary and whatever the local conditions. Eleven different pump models cover a wide range of heads and flows to allow pumping at extended depths (820 ft) or at high flow rates (80 gal/min) or anywhere in between, depending on your requirements. In locations where power is scarce and water is a necessity. Dry-Running Protection: This unique feature shuts down the pump if it detects water shortage. Every SQFlex pump comes standard with this sensor pre-installed, protecting the well from being over-pumped and the pump from damage. Helical Rotor Pump (3"): Designed to pump high levels very efficiently, these models allow pumping levels as deep as 820 ft. The 3 in. diameter allows the pump to go in installations where others can't. Centrifugal Pump (4"): Based on Grundfos' 40 years of experience in submersible pumps, these models are capable of providing high flows, up to 80 gal/min, at moderate heads. Materials: All Stainless steel for long pump life. Motor: Only one motor size covers the entire pump range. Designed for peak efficiency and complete reliability, the motor features integrated electronics, eliminating the need for complicated external controls. Motor Protection: Built in protections against over-temperature, overload, and over and under-voltage for reliability, as well as two-way communication with a control box to alert you in case there's a problem. Any Voltage: The motor can operate under any voltage from 30 - 300 VDC and 90 - 240 VAC without additional controls, making sizing and installation easy, even as a retrofit to existing installations. AC power capabilities mean every SQFlex pump has the ability to use an AC generator for backup power. Supply to pump 1 x 90 - 240 V –10%/+6%, 50/60 Hz. 30 - 300 VDC. Run-up time Depending on power source. Start/stop No limitation to the number of starts/stops per hour. Motor protection Built into the pump. Protection against: - Dry running by means of an external water level electrode. - Overvoltage and undervoltage. - Overload. - Overtemperature. Sound pressure level The sound pressure level is lower than the limiting values stated in the EEC Machinery Directive. Radio noise SQF comply with EMC Directive 89/336/EEC. Approved according to EN 50081-1 and 50082-2. Reset function SQF can be reset via CU 200 or by disconnecting the power from the power supply in 1 minute. Power factor PF = 1. It is recommended that the generator output must be equal to the motor input power P1 [kW] plus 50%. Minimum: P1 [kW] plus 50%. Earth leakage circuit breaker (ELCB) is used as an additional protection, this circuit breaker must trip out when earth fault currents with DC content (pulsating DC) occur. Borehole diameter SQF 0.6, SQ 1.2, SQF 2.5: Minimum: 76 mm. SQF 5A, SQF 8A, SQF 14A: Minimum: 104 mm. Installation depth Min. : The pump must be totally submerged in the pumped liquid. Max. : 150 m below the static water table (15 bar). SQF 0.6, SQF 1.2, SQF 2.5: ø2.3 mm. SQF 5A: ø2.5 mm. SQF 8A, SQF 14A: 4 mm x 20 mm. Pumped liquids pH 5 to 9. Sand content up to 50 g/m³. 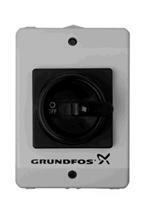 Note: Specifications and pricing of the Grundfos 3 SQF-3 SQFlex Solar Pump subject to change without notice. 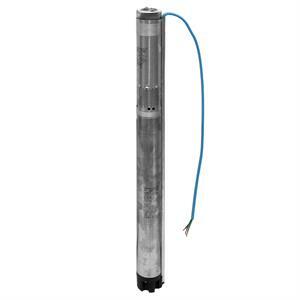 Illustrations and descriptions of the Grundfos 3 SQF-3 SQFlex Solar Pump do not claim to be complete.